Lalique, in the U.S. anyway, seems to be an almost-forgotten perfume house; the fragrances are hard to find. The first Lalique scent I tried (I believe) was Encre Noire in 2006: I sniffed; I bought; I still adore. 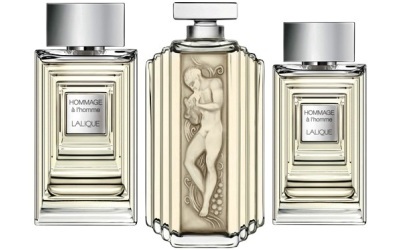 Lalique launched Hommage à l'homme* in 2012; it was created to commemorate Lalique’s 20th anniversary as a perfume house. This review deals with the Eau de Toilette version of Hommage à l'homme; I'd love to try the Extrait de Parfum (but realize that's an almost impossible wish). Hommage à l'homme goes on liquor-y with sweet violet leaf and candied violet flower notes; the violet leaf is especially sophisticated in this formula (not "sporty"), the violet notes are augmented by a sprinkle or two of pepper and a lovely ‘undertow’ of saffron and oud (not at all obnoxious or blunt). There’s also a hint of what smells like tobacco leaf hovering in Hommage à l'homme's heart. As Hommage à l'homme dries on skin it becomes soft — a bit talc-y with smoky benzoin combining with a powdery musk. I’m a powder lover in men’s perfumes…and I always have a powder-house fragrance on hand. At the moment, I’m powder-less, so will be adding a small bottle of Hommage à l'homme to the perfume cabinet soon. Hommage à l'homme smells “dressy” and suited to all seasons except (maybe) summer; it has good sillage and excellent lasting power. Hommage à l'homme's (Extrait de Parfum) crystal bottle looks gorgeous (see above, center image); it features an Art Deco “Pied Piper” (on both sides of the bottle). The Pied Piper is from a decorative panel created by René Lalique in 1929 for the Orient Express. The Eau de Toilette bottle’s design was inspired by another René Lalique project — the “Duncan” bathroom accessories collection of 1931. Lalique Hommage à l'homme Extrait de Parfum in the limited edition crystal flacon is $1,800 for 100 ml; Eau de Toilette is $92 for 50 ml and $125 for 100 ml. *Perfumers Christine Nagel and Mathilde Bijaoui; listed fragrance notes include oud wood, saffron. violet leaf and flower, musk, black pepper. The description does make me want to check it out. If this were a rational world, perfume houses would drop their marketers generating all that crazy perfume advertising and hire Kevin instead. Rick…and I am willing to move to Paris immediately. You can find it a very good price at fragrancex: 35 dollars 100ml. Rick…that is a great price, thanks. This sounds fabulous! I might have to buy “for my husband” since I’m theoretically no-buying. And then if it’s there right on the dresser, perfectly excusable for me to spray it too, n’est ce pas? This sounds lovely! Hope we see it soon here. I was wondering whether you would consider Infusion d’Homme a ‘powder scent’? I bought this blid last summer and I don’t regret it. I get very positive comments every time I wear it. I can’t wait to see what the Hommage à l’Homme Voyageur (due this year) will be like! Plat…yes, curious about that, too. Kevin, even though I enjoy your witty takedowns of unworthy frags, the lost opportunity that such perfumes represent and waste of your testing time always make me sad. Consequently, I’m delighted when you discover something worth wearing and, rarer still, something worth adding to your collection – plus available at a bargain price (on Amazon, also). I feel like cheering! Just lemmed a 100ml bottle at £25 delivered. Trigger, hope you enjoy it as much as I do. And straight in at number 1 on the must-sniff list goes Lalique Hommage a l’Homme. Thanks Kevin. I find (current) Dior Homme quite powdery but I love it and wear it. Is this similarly powdery? Similarly female friendly do you think? oh and ps – Christine Nagel. ’nuff said. Ah, it has been so long since I wore Dior Homme…I would be afraid to say. I had this on my list to try since its release, but i think im turned off to it now. I am not a fan of powdery fragrances so i will probably not like this. That bottle is legit and should be for the price.